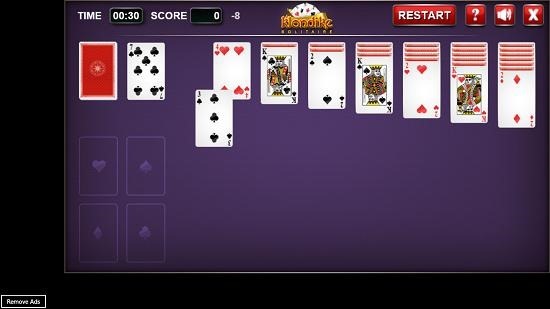 Klondike Solitaire + is a free solitaire game app for Windows 8 and 8.1 devices. The game is a must have for all the die hard fans of Solitaire style of gameplay of the classic cards game. When you launch the game, you will be presented with its main screen with a big Play button at the center of the screen which is hard to miss. The game allows for two types of gameplay modes – one mode allowing you to draw just one card from the deck and the other mode which allows you to draw three cards at once. The beginners may choose to draw one card at a time as that is the easier mode. The game has very soothing piano music which constantly plays back in the background and is pleasant and pleasing to the ear. You can keep an eye on your score and other vital stats like time elapsed etc. at the top of the gameplay screen. 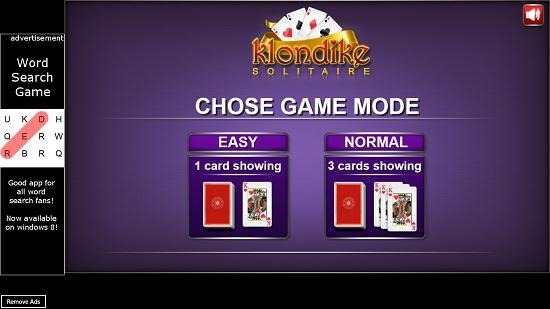 Klondike Solitaire + is available for free from the Windows App Store. 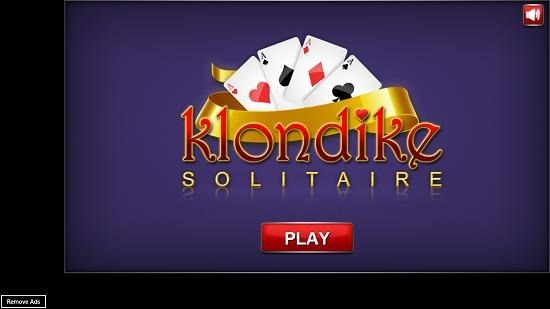 When you install and run Klondike Solitaire + on your Windows 8 or 8.1 device, you will be presented with the below shown screen. In the above screen, simply click on the big red Play button at the center of the screen to be taken to the difficulty selection screen. The difficulty selection screen of the game looks like the screenshot below. You can choose from Easy or Normal difficulty levels. The game also has a nice background piano track but if it gets annoying for you, you can choose to click on the sound button at the top right corner of the screen which is also visible in the screenshot above. The gameplay screen of the game is shown in the screenshot below. You can see the toggles to restart the game, view a hint, mute the sounds or quit the game at the top right corner of the screen, and you can also see the time counter ticking away in the top left corner of the screen. The score is visible right next to the time ticker. This winds up the main features of Klondike Solitaire + for Windows 8 and 8.1 devices. Klondike Solitaire + is an excellent Solitaire game app for Windows 8 and 8.1 devices. You can grab this app for free from the link below.